The leaf is from a Book of Hours dismembered by Otto F. Ege for inclusion in 42 specimen sets of medieval manuscript leaves he compiled in the 1940s under the title "Fifty Original Leaves from Medieval Manuscripts". The leaves from the Book of Hours are no. 50 of the 50 chosen exemplars. The leaf came onto the market in 1981, sold by Maggs Bros to the Friends of the Australian National University Library. Contents: Beginning of the Te Deum hymn. Decoration: Cursive gothic script skilfully penned with accented letters and flourished initials. One 2-line and 18 1-line initials in burnished gold on blue or pink grounds with ovals painted in the opposite colour and heighted in white. Matching line fillers. 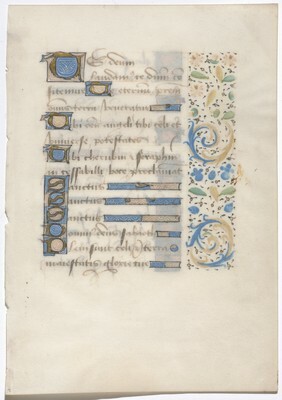 Marginal panel (recto) of acanthus tendrils in blue and gold and scattered flowers, petals and leaves.